Home » Beauty » Rhassoul Clay Benefits – How To Use For Hair, Skin And Face? Rhassoul Clay Benefits – How To Use For Hair, Skin And Face? Rhassoul Clay is a high-quality naturally occurring soothing clay, incredibly rich in minerals. It was used by royals and nobility in ancient Rome and Egypt, and has continued to be popular for use in spas to treat skin and hair as soap, skin conditioner, shampoo, and facial masks. Read on to find information on what this clay is, its benefits & uses & where to buy? Is Rhassoul Clay same as Moroccan Red Clay? Yes! It is also known by the names Red Clay, Red Moroccan Clay, Ghassoul Clay and Oxide Clay. This amazing clay has a silk-like feel and can help even out skin tone, reduce blemishes and blackheads. In fact, clinical studies and testing on Rhassoul found that it has the unique ability to both nourish skin and reduce breakouts, so many people use it daily as a natural soap and shampoo. According to findings from various studies, Moroccan Rhassoul clay can increase skin elasticity, and reduce skin dryness and flakiness. Rhassoul clay naturally has a powerful, negative electromagnetic charge, while the majority of toxins under your skin have a positive charge. So it can help draw out blackheads and other impurities and detoxify your skin. This makes it effective as a make-up remover and an all-purpose face wash.
How to Use Rhassoul Clay For Face And Hair? It’s very easy to use as a daily cleanser instead of soap. All you need is to add water. You can add hydrosol if you like too or mineral water but using water is just fine too. And you don’t need a lot of the clay. Just a quarter of a teaspoon blended with water and it’s ready to cleanse your face thoroughly. (a) Basic Recipe: This recipe is very simple, yet very effective. Just mix it with water or something like rose water to form a silky paste. Rub the paste onto your face, let it dry, and then wash it off. (i) Mix the rhassoul clay, argan oil, raw honey and lavender essential oil (optional) in a glass bowl. For mixing use a non-metal spoon. (ii) Add enough rose water to the mixture to make a smooth and semi-thick paste. It should not be drippy. (iii) Take some of the mask from the bowl using clean fingers. Gently apply it all over your face in a thick coat. Avoid the area around your eyes and mouth. (iv) Wait for 5 minutes for the mask to do its magic then rinse it off. (v) Pat your face dry, tone and moisturize your face as usual. When mixed with other ingredients, it can be used as an exfoliator and smoothing facial scrub. I prefer to combine 1 tablespoon of rhassoul clay with 1-tablespoon oats and apple cider vinegar to make a paste. You can use it once a week to exfoliate your face. Massage it onto your face to exfoliate for about 1-2 minutes, leaving it for 5 minutes to dry and then wash it off. Since early times, Moroccan women have used rhassoul clay as a hair shampoo. 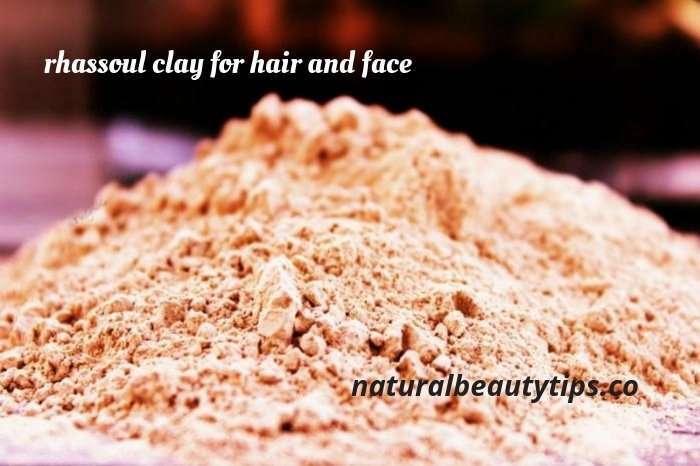 It is said that the clay improves the hair texture and volume, softens the hair and eliminates dandruff. (i) Mix1 tablespoon rhassoul clay with 1/4 cup of water to make a thin mixture. Avoid metals and plastics, so use a ceramic, glass or wooden bowl. (ii) Let the clay hydrate for about 5 minutes. Stir the mixture well with a wooden spoon/spatula to dissolve all the lumps and bumps. (iii) Wet your hair and then apply it like a shampoo, massaging in, then rinsing out thoroughly. For hair, it is important not to let the mixture dry as it can cause hair breakage if it hardens. Best is to massage into hair in the shower and leave for about 30 seconds before washing. (i) You can add in any oil of your choice, or different ingredients to the mix. Some people like adding apple cider vinegar, or yogurt, or honey, or essential oils. (ii) You can add water to the clay mix if you need it thinner to reach the ends of your hair. (i) Internal Use: Unlike some healing clays, Rhassoul clay is not meant for internal use. But it’s superb for external use. (ii) Presence of Lead: Unlike Bentonite Clay, Rhassoul clay is not known to contain any lead. For this reason, Rhassoul can be substituted in recipes like hair and facemasks in place of Bentonite. (iii) Adsorbing Power: This is what makes clays so beneficial for cleansing. Adsorption (with a D) refers to the process by which clays like Rhassoul attract positively charged particles to take out them. When the clay is washed off, the impurities go with it, leaving smooth skin. (iv) Minerals: Rhassoul is richer in minerals than many other types of clay. Especially the higher silica, magnesium and potassium contents make it particularly good for hair, skin and nails. Because of this reason this clay can be used daily instead of soap as a gentle way to cleanse that won’t strip skin of beneficial oils. Where To Buy Rhassoul Clay? This natural clay from Morocco is incredible for hair and skin; and is inexpensive too! Hello Ma’m, my hands became black due to more sun heat while riding bike, so please tell me how to whitening the skin.